A standard is a guideline document that reflects agreements on products, practices or operations, by recognized government, industry or professional bodies or trade associations. A standard provides requirements, specifications, guidelines or characteristics that can be used consistently to ensure that materials, products, processes and services are fit for their purpose. It specifies requirements for establishing, implementing, maintaining and improving an energy management system, whose purpose is to enable an organization to follow a systematic approach in achieving continual improvement of energy performance, including energy efficiency, energy use and consumption. It contains requirements applicable to energy use and consumption, including measurement, documentation and reporting, design and procurement practices for equipment, systems, processes and personnel that contribute to energy performance. It applies to all variables affecting energy performance that can be monitored and influenced by the organization. ISO 50001 is applicable to any organization wishing to ensure that it conforms to its stated energy policy and wishing to demonstrate this to others, such conformity being confirmed either by means of self-evaluation and self-declaration of conformity, or by certification of the energy management system by an external organization. 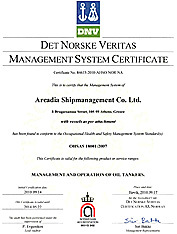 On July 2012, ARCADIA SHIPMANAGEMENT CO LTD became the first shipping Company to obtain Certification on ISO 50001:2011 by the Norwegian Classification Society DNV. Standards for Certification are publications that contain principles, acceptance criteria and practical information related to the Society's consideration of objects, personnel, organizations, services and operations. Standards for Certification also apply as the basis for the issue of certificates and/or declarations that may not necessarily be related to classification. 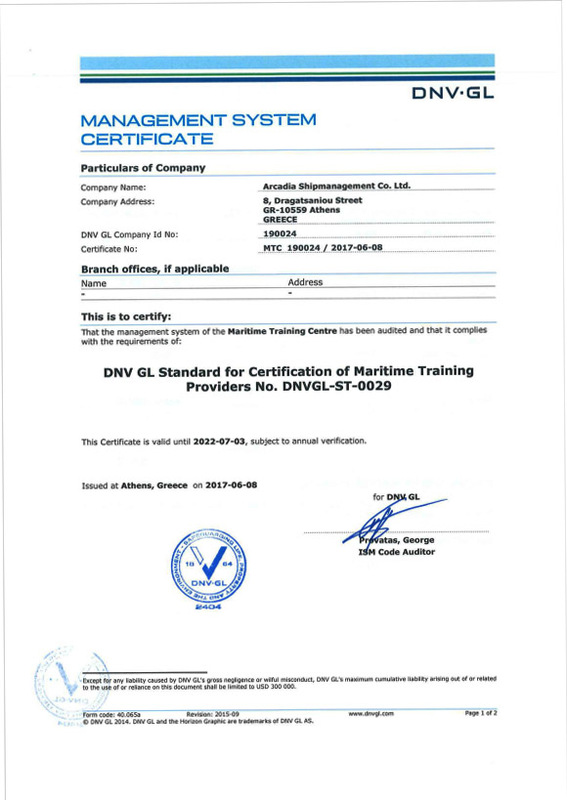 This standard gives requirements for learning providers within maritime and offshore field, offering academic and/or vocational training and education, and leading to the issuance of certificates so as to ensure the quality of development and delivery of courses and programmes. The objective shall ensure that programmes and courses being offered within the maritime and offshore sector are properly designed, contain clear objectives as to results, are carried out by qualified instructors and are evaluated and improved in line with market demands and experience. The maritime training centre's top management shall establish a quality policy and ensure that quality objectives are established and that the objectives are measurable and consistent with the quality policy. The maritime training centre's management shall also ensure that customer requirements are determined and met with the aim of enhancing customer satisfaction. The maritime training centre shall continually improve the effectiveness of the management system through the use of quality policy and objectives, audit results, data analyses, corrective and preventive actions and management review. OHSAS 18001 is the internationally recognized standard for an occupational health and safety management system (OHSMS). It gives a framework to consistently identify and control health and safety risks, reduce the potential for accidents, help achieve compliance with health and safety legislation and continually improve an organization’s performance. It is suitable for organizations of all sizes that want to set up formal procedures to manage health and safety risks. It takes a risk-based approach to documentation – enabling a Company to decide what is needed by reviewing risks and evaluating the effectiveness of current controls. OHSAS 18001 certification gives a competitive edge, reducing the cost of tendering and improving financial performance through health and safety improvements, reduced down time and decreased insurance premiums. A safer workplace, by enabling an organization to identify hazards, assess risks and put the necessary risk control measures in place to prevent accidents. Stakeholder confidence, by addressing to stakeholders that the organization has met a number of legal and regulatory requirements, providing stakeholder’s confidence in the organization. Morale, by proving a clear commitment to the safety of staff, establishing a positive health and safety culture, and contributing to a more motivated, efficient and productive workforce. Reduced costs, as fewer accidents mean less expensive downtime for the organization and improved insurance liability rating. Monitoring the regular assessment process, will enable for continually monitoring and improvement of health and safety performance. OHSAS 18001 has been written to be seamlessly integrated with other management system standards such as ISO 9001 for Quality and ISO 14001 for Environment. 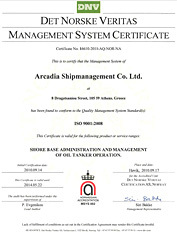 ARCADIA SHIPMANAGEMENT CO LTD has been Certified on OHSAS 18001:2007 (Occupational Health and Safety) – on September 2010 (initially Certified upon OHSAS 18001:1999 – on February 2005), by the Norwegian Classification Society DNV. ISO 14001 is the world’s most recognized framework for environmental management systems (EMS). It specifies requirements for an environmental management system to enable an organization to develop and implement a policy and objectives which take into account legal requirements and other requirements to which the organization subscribes, and information about significant environmental aspects. It applies to those environmental aspects that the organization identifies as those which it can control and those which it can influence. It sets out the criteria for an environmental management system and can be certified to. It does not state requirements for environmental performance, but maps out a framework that a company or organization can follow to set up an effective environmental management system. It can be used by any organization regardless of its activity or sector. Using ISO 14001 can provide assurance to company management and employees as well as external stakeholders that environmental impact is being measured and improved. All the requirements in ISO 14001 are intended to be incorporated into any environmental management system. The extent of the application will depend on factors such as the environmental policy of the organization, the nature of its activities, products and services and the location where and the conditions in which it functions. 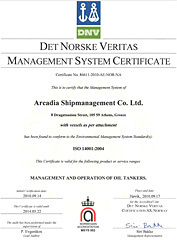 ARCADIA SHIPMANAGEMENT CO LTD has been Certified on ISO 14001:2004 (Environment) – on April 2008 (initially Certified upon ISO 14001:1996 – on March 2004), by the Norwegian Classification Society DNV. The objective of the Green Award certification scheme is to promote the safe and environmentally friendly behavior of ship and crew/management, mainly by achieving international acceptance, recognition, regulation and coordination of the “Green Award” Certification, all in observance of (inter)national conventions, legislation and developments in the area of ship lay-out, equipment, crew, operations and management. The Green Award Requirements address issues related to quality, safety and environment and pay extra attention to crew elements. The most recent update of the Green Award requirements covers Monitoring of Ship Exhaust Emissions, Marpol NOx emission limits, ECDIS and Hot Work procedures. 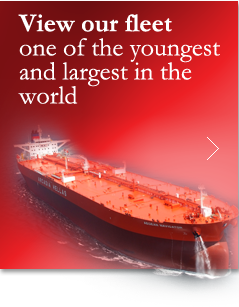 From Tallinn to Tokyo and from Venice to Vancouver, the Green Award Foundation is active all over the world with the certification scheme for dry bulk carriers and oil tankers that go above and beyond the set standards in cleanliness and safety. All efforts are made to benefit the marine environment, including cleaner seas. 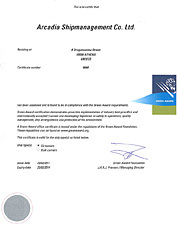 ARCADIA SHIPMANAGEMENT CO LTD has been Awarded with the “Green Award” on February 2005. THESIS (The Health, Environment, Safety Information System) is an application, originally developed by Shell and now jointly with ABS Consulting. It was developed specifically to create and manage robust safety management systems. It has been based on the Bow-Tie concept to visually display how hazards are controlled and how the risk associated with them is reduced to As Low As Reasonably Practical (ALARP). It documents the provenance of information and the reference sources from which the information is obtained. It is an extremely flexible and simple tool whose application extends from safety, health and environment risk into any aspect of business exposed to hazards and risks. It is frequently used to build management systems from concept as well as capture and refine those that already exist. THESIS is a software tool that can effectively demonstrate how a facility's Safety Management System can be implemented. 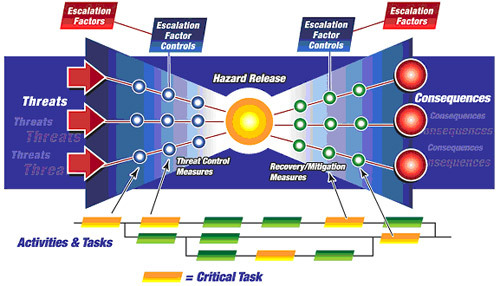 It assists companies/operators in the analysis and management of the hazards and risks to which their business is exposed, and graphically displays and illustrates the relationship between hazards, controls, risk reduction measures into a representation that has become to be known as the THESIS bow-tie methodology. ISO 9001 specifies the basic requirements for a quality management system (QMS) that an organization must fulfill, to demonstrate its ability to consistently provide products (which include services) that enhance customer satisfaction and meet applicable statutory and regulatory requirements. The standard can be used for certification/registration and contractual purposes by organizations seeking recognition of their quality management system. The standard is based on a number of quality management principles including a strong customer focus, the motivation and implication of top management, the process approach and continual improvement. Using ISO 9001 helps ensure that customers get consistent, good quality products and services, which in turn brings many business benefits. Measurement, monitoring, analysis and improvement. Together, the five sections of ISO 9001 define what an Organization should do, to consistently provide product that meets customer and applicable statutory and regulatory requirements. In addition, the Organization will seek to enhance customer satisfaction by continual improvement of the quality management system. 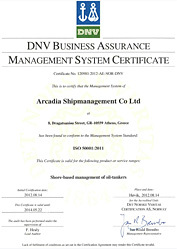 ARCADIA SHIPMANAGEMENT CO LTD has been Certified on ISO 9001:2008 (Quality) – on June 2009 (initially Certified upon ISO 9001:2000 - on December 2001), by the Norwegian Classification Society DNV.